Beating out the multi-million dollar CBC news and the Ottawa Citizen (hmmm, there’s a joke in there somewhere) the NFB’s super cool Filmmaker-in-Residence site won a Canadian New Media award Monday night in Toronto. A Vancouver film maker I know says he saw a demo of the site while in Toronto for the Hot Docs film festival, and the NFBer showing the site mentioned simply that it was done by ‘somebody from Vancouver’. Those somebody’s are all vets of the now defunct (and much missed) CBC Radio 3 Magazine, which may explain why its sooooo damn hot, and proving once again that Vancouver harbours some of the best Flash brains around. Congrats guys, you know who you are, and I for one am super proud of you work (again). We finally got out to give our little boat a proper shake-down cruise. 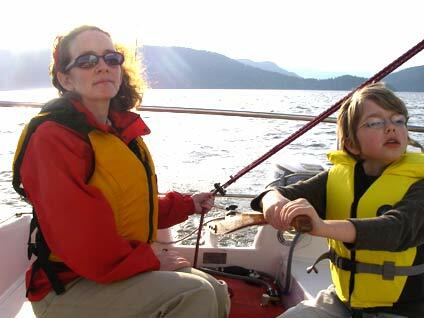 Garnet on the tiller, Eileen on the main sheet – and the glory of BC in the background. 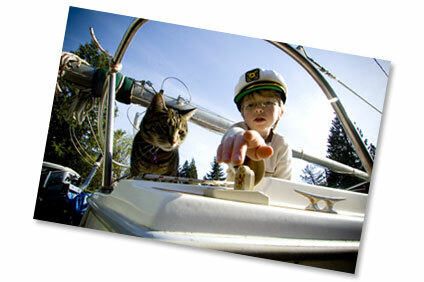 I’ve been remiss in posting – busy launching a new web site and a new (old) sailboat. The web site is for Capers Community Markets and should go went live today in the next couple of days. The boat’s a lovely old Catalina 22 swing keel that’s currently on a trailer in the driveway as I clean up some of the electrical (well, all of it actually) in preparation for a summer on Georgia Straight. The interesting thing is Ozzie has taken a real liking to the little plastic boat. He’s been exploring every nook an cranny and climbs the step ladder to join me as I putter around below. He’s been quite attentive as Garnet explains all the “parts of a boat” to him. 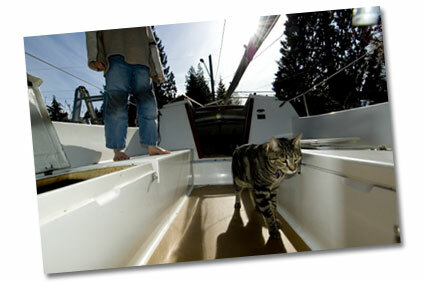 The boys and I have hatched a plan to take Ozzie out for a sail after we put the boat in the water next week. Oh, and special thanks to the guys at Martin Marine in North Vancouver for the patience helping me figure out how to get the boat ship shape. Next stop will be the chandlery to see if we can find a cat PFD. Safety First! Oh (again). I you have a little six foot dinghy you’d like to sell, let me know. A sales call this evening from Telus at 8:05 pm on my home-office line. The pitch was for Telus TV. They had caller ID blocked.